book club members and Janeites gathered to hear a delightful lecture on Mansfield Park by author and Professor of English at Columbia University, Jenny Davidson. The series of lectures is sponsored by HSBC Bank and Oxford University Press. As I had forgotten to bring a copy of Mansfield Park along with me, I was gratefully able to look over the shoulder of JASNA’s Meg Levin and read from her copy. Focusing on Volume III Chapter 8 and Volume II Chapter 6, Davidson spoke of Fanny Price’s point of view and Fanny’s opinion (we sometimes think that Fanny — being shy and reserved — has no opinion when, in fact, she does). It was refreshing to hear someone focus on Fanny’s inner strength. One must remember that Fanny rejected Henry Crawford’s proposal; an impressive act of strength to be sure. That slim streak of inner strength is boosted considerably in Patricia Rozema’s movie version of Mansfield Park (which Davidson cited). It’s a delightful movie — full of Austenisms — but not true to the book. 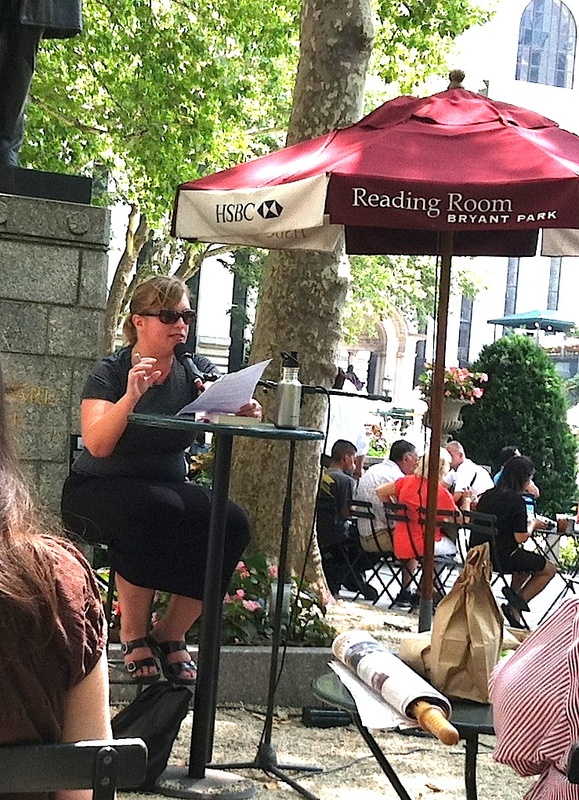 Discussing Mansfield Park in Bryant Park while sipping on an an iced-coffee on a warm breezy day in New York City…. 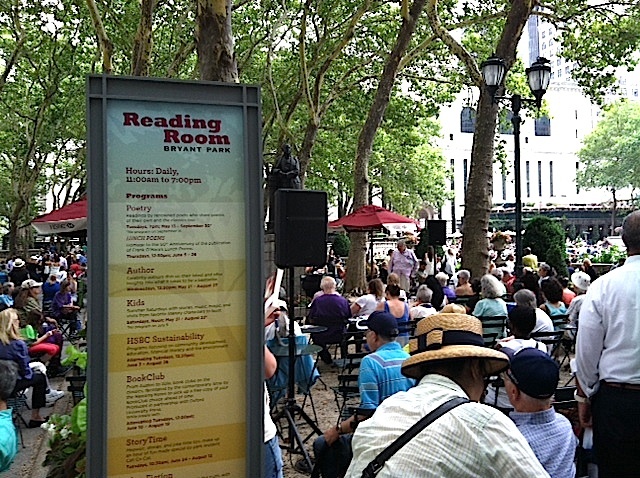 I love both Mansfield Park and Bryant Park, and as you know I really wish I could have been there to hear Jenny Davidson. Thanks very much for sharing the photos and your experience of the event, Mary. Thanks Sarah! I had the photos in my phone and thought some Janeites (like yourself) might like to see them. They had a great turnout, so I’m hoping they might add another Austen book to their future reading list. Are they marking the anniversaries? Was there something for P&P last year? Maybe Emma, in 2016…. I just starting following them so I’m not sure. But, that certainly makes sense. There’s an interesting one-night writing workshop on their schedule. I’m considering going. It sounds like it was a wonderful event. Hi Grace, Yes, it’s one of my favorite quotes as well…and so true. 🙂 Thanks for stopping by. I’ve heard of it, have heard good things about it, but I haven’t read it yet. I will now. Thanks so very much for your interest in Clump A Day. Janeites Unite!! Sounds like it was a fascinating and enjoyable day – I would have loved to have been there. I also wanted to say thank you for popping by and following my blog – but even more for attracting me to yours, from where I have discovered the “Invitation to Mansfield Park” and the wonderful articles that are part of it, I’m slowly reading my way through them – but progress will be limited today as in a couple of hours my husband is taking me to the Jane Austen House Museum in Alton as an early birthday present! What a wonderful birthday present! I hope to one day get there myself. Happy you found Sarah Emsley’s blog (“Invitation to Mansfield Park”) too. It’s been a wonderful party thus far and far from over! Enjoy your trip to Chawton House :-)! Thank you. It was wonderful trip – and as an added surprised, we stayed overnight at Grayshott Spa, which is the real life house upon the eponymous Larkwood is base in Valerie Mendes recent novel. And I’m love with the Mansfield Park party on Sarah Emsley’s blog, thanks so much for the introduction. I’m delighted that you’re both enjoying the Mansfield Park party. I’m learning so much from all the discussions and I’m glad we still have a few months left to celebrate this brilliant novel. It’s been a few years since I last visited Chawton Cottage so I am very envious of your trip!